Canister & Grape - A Website for Wargamers: SAGA Scots Warlord Complete! Truly, from little things, big things (or at least, more complicated little things) grow; this unassuming pile of pine bark chips and pebbles was to become the lofty crag from which my Scots Warlord surveys the field of battle. 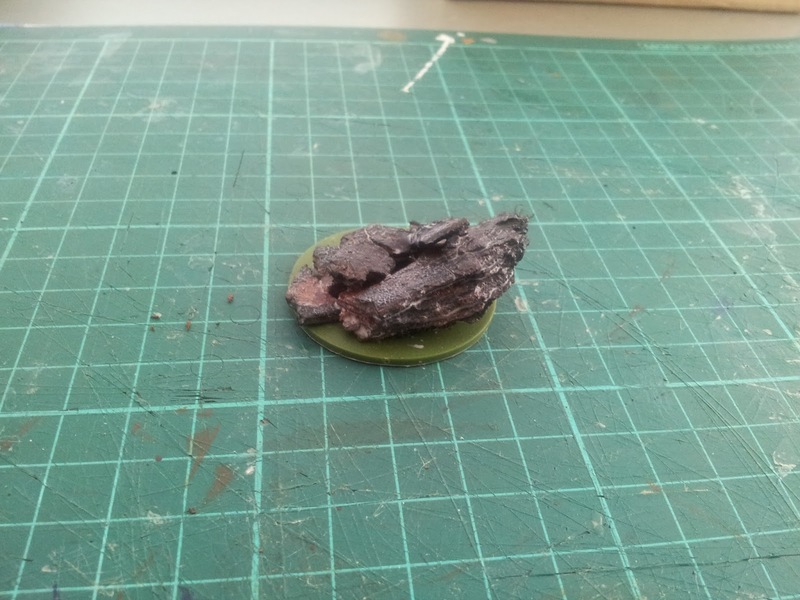 I was looking to do something in the basing department which would allow my Warlord to stand out from the rest of the warband and convey something of the windswept terrain of the Highlands, so we're going with a rocky outcrop theme. As you can see, this substructure is filled in with spackle (aka polyfilla, call it what you will), which is built up around where the figure will stand. I drilled and pinned in the centre of the figure's 'footprint' for added security, and undercoated the assembly before texturing and drybrushing. "A' yer base ur belong tae us!" At this point, I think I was getting into the whole Highland landscaping thingy a little too much, since I went a little mad dotting the rocky outcrop with spots of lichen to give it that 'authentic' Caledonian touch. 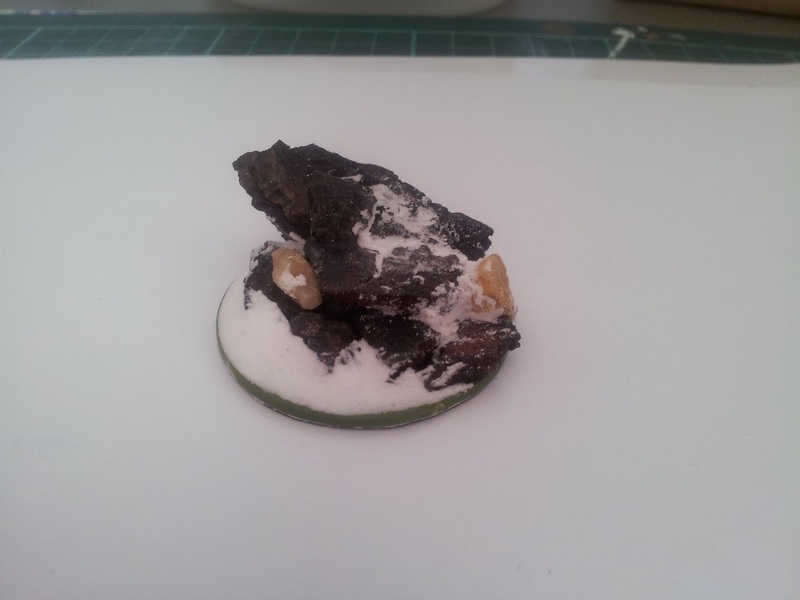 I then glued the fig into place on the pinned footprint and filled the gaps around his cast base with green stuff. The putty was roughly sculpted to mimic the 'strata' of the pine bark, and left to cure. Once the putty had cured, it was time to paint it to match the surrounding outcrop, dullcote the model, and voila! After all the tartan of the warband, it was nice to muck about with bits of stuff and actually build something, even on this modest scale. I'm pretty pleased with the the result, and think it complements the figure quite nicely. So what's next? 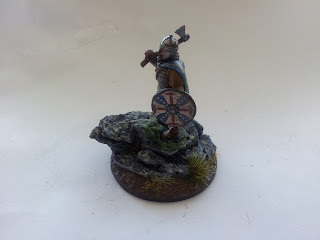 My partner in crime and Blogmeister-General, the indefatigable Millsy, has 6 points of excellent Anglo-Danes with some Levy to provide shooty support, while our good mate Nugget has completed a Viking AND a Strathclyde Welsh warband, so I'm probably going to need some lads with bows to encourage these potential threats to keep their distance. 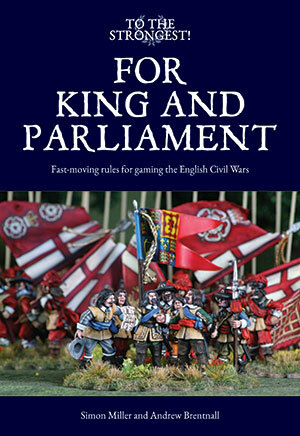 Alas, a visit to the gaming shop today turned up no Scots levy, so I may have to resort to buying online. Or... I do have a pack of eight psychos for hire, the Gall-Gaedhil, aka the Sons of Death; these guys aren't shooty, but they tend to charge in and keep the enemy occupied... That's two more points right there. Well, we'll see what inspiration hits when next I plonk myself down at the workbench. The base compliments the figure perfectly. That last photo really shows the construction of the rocks to good advantage. I'm happy with the way the big lad turned out. The pose is a little static, but the sculpt is well-executed, and repays the time taken to paint it. Great base. Really makes the warlord stand out, so to speak. 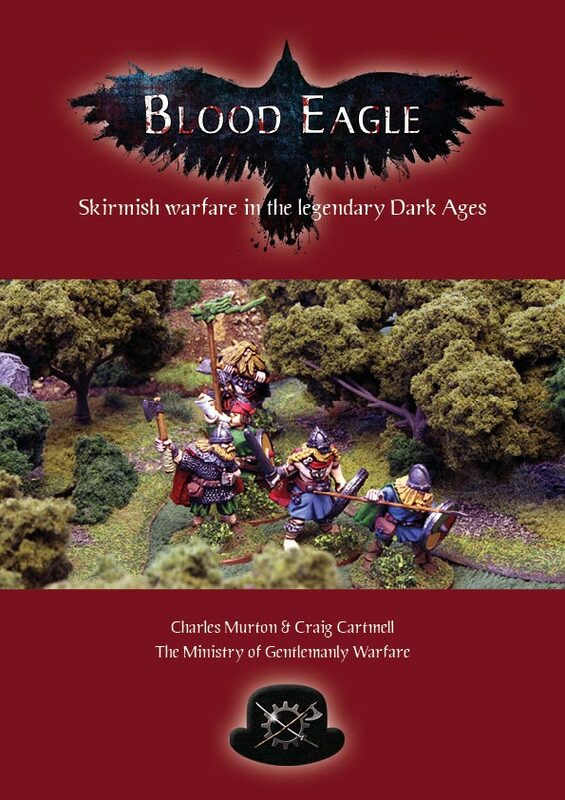 Thanks Sean, I'm beginning to look speculatively at the rest of the warband and wondering whether or not they'd benefit from similar treatment. 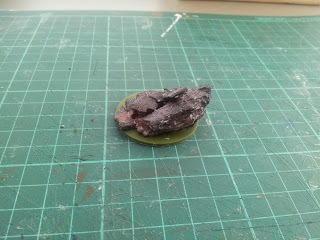 Probably something I should have considered BEFORE that final coat of varnish! Brilliant work, Ev! The lichen was a great addition. I wish your Scots great success, and I think your warlord should get an extra die in combat for having the height advantage. We'll see how far we can bend those rules when they hit the table for their first outing! Thanks for the kind words, Monty. Ahem... "I cn see a-hinn fae oop eere ken." Great stuff on the base. Hope he performs well on the table! I still have to paint the four hearthguard needed to push that rock into battle while he stands on it. Thanks Loki, love your work! Much appreciated! Now that's impressive and the lichen is just a perfect little touch, bravo Sir. Thank you, Mr Awdry, that is praise indeed. Your wonderful vignettes were instrumental in motivating me to complete this project to a playable standard, so thanks again! Mate, that is absolutely beautiful. I'm kind of lost for words to describe it to be honest! 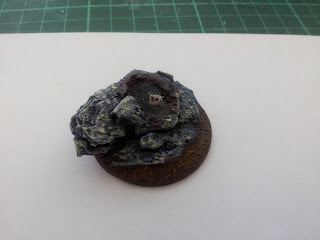 The basing is really something, especially the lichen. Care to share how you executed it? Thanks Millsy, that means a lot to me! A very pale green (GW Nurgling Green in this case) applied in dots of varying sizes. A smaller dot of paler shade is added to the centre of the larger green spots to simulate older growth which has faded over time. Still older growths can be depicted with a lightly-applied ring of the pale shade. The reddish lichen was simply dots of a medium orange-brown (GW Vermin Brown). I sensibly kept these to a minimum. 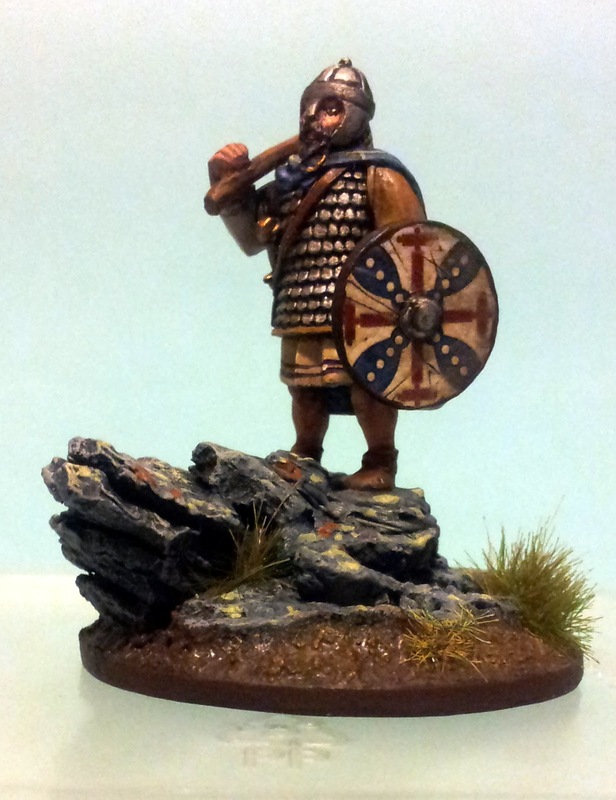 The shield transfers are part of the Dark Age Scots range from Little Big Men Studios, they are brilliant. 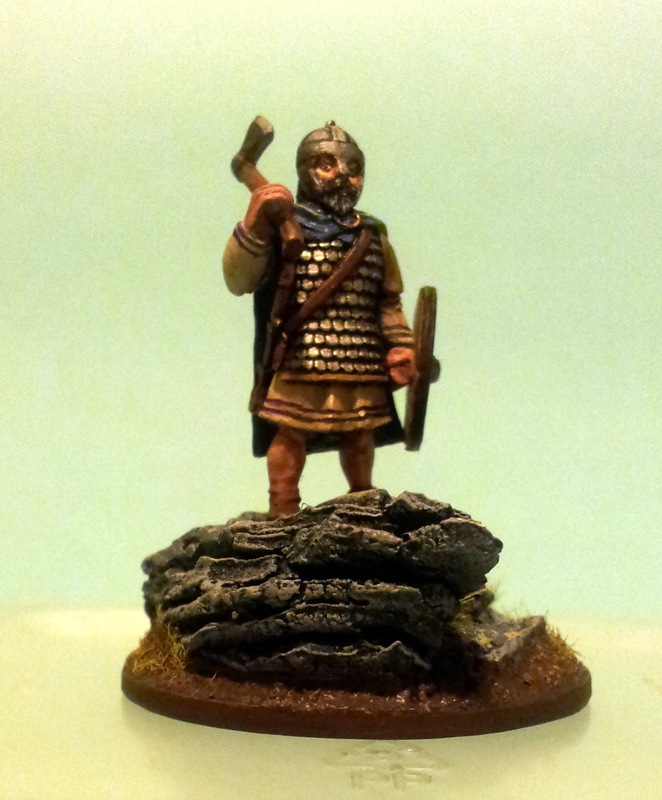 The design is a bit less Pictish than then others in the warband, but it seems to suit him! That's a nice warlord you have created. The base is excellent. He will stand out on the tabletop. well, he's certainly head and shoulders above the rest of them!